I love this verse because it speaks to my own experience: when I turned 40 I finally found the courage to come out to myself, to God, and to my friends and family. The coming out went well enough but life was complicated as I was married and had two children. Over the next year I began to feel more and more trapped and despairing. Conservative evangelical friends suggested that I should pray that God would heal my marriage so I did pray most earnestly and sincerely and God, our God of Surprises, did hear me. However, he did not heal my marriage but he did heal me: first, I became so ill that I had to see a doctor – another member of that conservative evangelical church – who took time to listen and unexpectedly said: “You cannot go on like this. You need to leave”. His words and his kindness gave me hope that day and thus I began to look for a constructive way to leave. Life can indeed be complicated and difficult. These painful changes affected everyone in our family but I am pleased to look back now and realise that they also set my ex-husband free to re-make his life. I only wish that I could go back those 25 years and show my troubled desperate self this photo of the settled loving relationship and positive future which our God had in store for me. Lord Jesus, we thank you for the gift of hope, for unexpected kindness when we need it most, for staying with us when we are desperate. We pray today for all those who feel trapped and cannot see their way out. May they feel your healing touch, your arm around their shoulder to help them take heart and to begin anew to have hope. 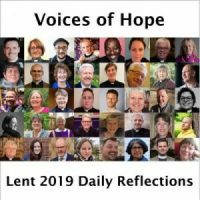 This entry was posted in Guest Contributors, Human Sexuality, Voices of Hope. Bookmark the permalink.